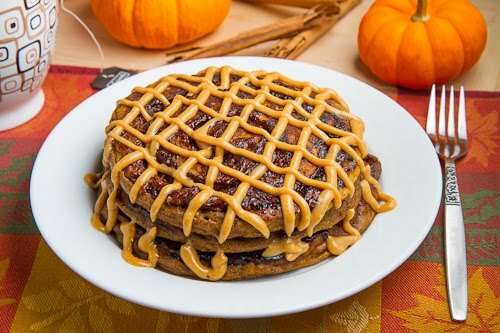 Pumpkin pancakes with a swirl of cinnamon cooked right into them served topped wit a caramel cream cheese ‘frosting’. Mornings could not get any better than this! I know that Thanksgiving weekend, let alone Thanksgiving day, can be quite busy but these pumpkin pie cinnamon roll pancakes are as easy to make as making normal pancakes, and I used my favourite pumpkin pie pancake recipe, and swirling a mixture of cinnamon, butter and sugar onto the top of the pancake after pouring the batter into the pan. After that, once the bubbles arrive, you simply flip the pancake as normal and cook the swirl side. The swirl mixture on the pancakes surface causes the batter to cook around the swirl leaving a nice hole filled with cinnamon-y goodness! In addition to the swirl, some of the sugar in the swirl mixture actually caramelizes on the surface of the pancakes making them even better. The pumpkin pie pancakes by themselves are so delicious, light, moist and fluffy that they are sure to put you into pancake heaven but then add the cinnamon swirl and you take things way over the edge! These have to be my new all time favourite pancakes! Tip: You want the swirl mixture of cinnamon, butter and sugar to be thicker, more paste like, rather than liquid and flowing for the best results. Although I could easily finish off a batch of these pancakes by themselves, I could not help but think about a topping! Normally pancakes are served with syrup but cinnamon buns are topped with frosting and although I had some tasty ideas for both syrups and frostings I decided to go with a frosting. A basic frosting would have been just fine but since caramel goes so well with pumpkin I could not resist using some caramel sauce as the sweeter for the cream cheese based frosting and it was absolutely divine! Mix the butter, brown sugar and cinnamon, place them in the corner of a small plastic bag and set aside. Mix the flour, baking powder, baking soda, cinnamon, nutmeg, cloves and ginger in a large bowl. Pour 1/3 cup of the mixture into the pan. Cut a small hole in the corner of the plastic bag and squeeze out a swirl of the cinnamon mixture in a swirl around the top of the pancake batter. Heat until the surface starts to bubble and the bottom is golden brown, about 2-3 minutes, flip the pancake and cook the other side until the bottom is golden brown, about 1-2 minutes. Mix the caramel sauce and cream cheese, give them a 15-25 seconds in the microwave and drizzle over the pancakes. Good Lord! This is amazing! Oh.Em.Gee. This is just too amazing! Whipping up a batch of these tonight for tomorrow's breakfast! The most amazing pancake in the world. 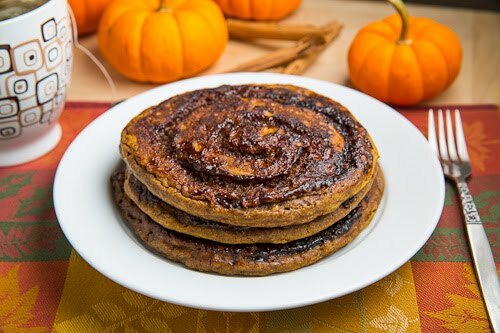 I've been craving pumpkin pancakes like mad, and I LOVE cinnamon rolls. You are a genius to swirl in buttery sugary cinnamon into the pancake like that! Looks absolutely sinfully delicious. I really will have to make this, because you've magnified my cravings to OVER 9000. Those pancakes are awesome and extremely droolworthy!!! I can't believe I still haven't made these yet! They look irresistible. OMG this looks amazing!!!!! Fabulous. Feel like having bite now. i might become a morning person if i knew i was waking up to these! I want a pumpkin pie so bad right now 😀 ! I like that you feature recipes with ingredients easily available outside North America – thanks for that. I like that your recipes feature ingredients easily available outside North America – thanks. This looks like a cake, not like pancakes! I love the color of your frosting. 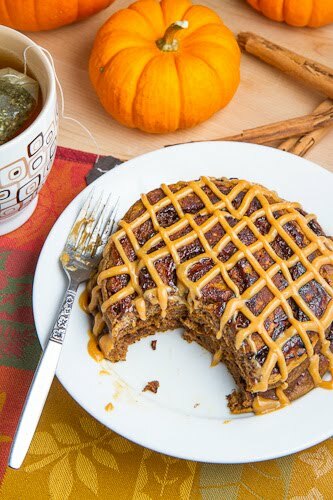 just stumbled upon your blog and i love it, especially all the pumpkin recipes! you've got a new fan! These are just gorgeous and sound like an absolutely dreamy breakfast! OMG – simply gorgeous. Your styling is exquisite…! Beautiful job, that looks amazing! This is such a great idea! Those look wonderful and like a very special treat for Canadian Thanksgiving! I made these for my father. He loved it so much, he jumped for joy. He brought me a new car and a new house because he loved them so much! Now he is even thinking about paying for my whole wedding and grand kids college funds in future. Just because i made him these! This is a good recipe for those of you who enjoy your breakfast fare sweet and rich. I found the cinnmon/butter/sugar mixture you swirl on the pancake batter difficult to work with. The butter melts immediately and tends to run out the corner of the bag. I finally decided to refrigerate the bag while the pancakes cooked. Much easier to work with chilled. The cream cheese/caramel frosting was too rich for most of my family, so we opted for the maple syrup topping instead. I know the post is from last fall but the recipe looks amazing. That frosting! Pinned! I've had this recipe bookmarked for a while after browsing your breakfast archives for ideas (I know, I know) and finally made it today–completely perfect! 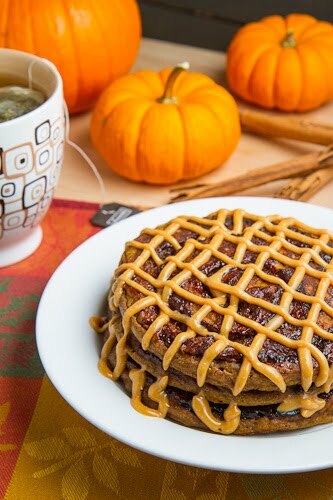 These have to be some of best pumpkin pancakes I have tried–fluffy, perfectly spiced–and the caramel just puts it over the top. thank you for another delicious recipe. June: I am glad that you enjoyed them!